Toshiba is back with a new range of high-performance 7,200 RPM 2.5″ hard drives, where among them will include a 500GB capacity model that ought to be suitable for those who want performance and a spacious storage solution rolled into a single device. There will be four models that are in the limelight today, where they will deliver more than a 13% performance improvement in disk operations in comparison to Toshiba’s previous 7,200 RPM family. Despite an increase in performance, they will also reduce their environmental impact by eliminating the use of selected toxic and hazardous chemicals during the manufacturing process. Apart from that, the series has been stringently tested by the Serial ATA International Organization (SATA-IO) and gained a SATA-certified 3Gb/s logo in the process for added peace of mind. What you see in the image here is the high-performance MKxx56GSYseries that will boast a maximum capacity of 500GB, which is suitable for both commercial and consumer notebooks, PCs, gaming notebooks and all-in-one desktop PCs. The MKxx56GSY models will also offer increased responsiveness of the overall system in various areas including application loading and general data processing. Toshiba has not forgotten to improve the user experience by offering extended battery life with lower power consumption in standby and sleep modes as well as faster start-up operation. 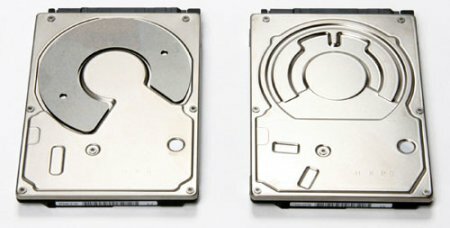 Currently, Toshiba’s new 7,200 RPM 2.5″ hard drive models will begin to ship to various PC manufacturers in limited quantities this quarter, where they will go full steam ahead with production in the fourth quarter later this year. There is no word on pricing, but we’re pretty sure they ought to arrive in a variety of notebooks and netbooks sometime early next year, and we hope that the 160GB hard drive found in most netbooks will be replaced by something larger – 500GB perhaps?